Over a two-year period, Murray James Silvester, 59, killed hundreds of protected birds in and around Tubbut, Australia. According to the reports, Silvester, would kill sheep, inject poison into their necks and then leave them around the property on which he worked. He hoped that wedge-tailed eagles — Australia's largest bird of prey and a protected species — would engorge itself on the sheep carcass and die. And boy did they. 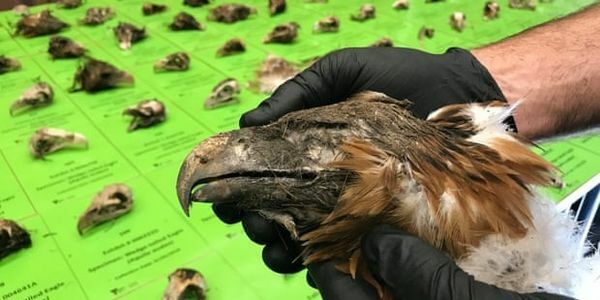 Officials found a total of 406 dead eagles along with other protected birds. Experts say the wedge-tailed eagle population will take more than 2 years for it to get back to normal. For causing the animals to suffer and die his single-handed attempt to destroy an entire population of protected bird, how much time do you think Silvester might have to serve? According to ABC News, the maximum penalty he could have faced was $350,000 or six months in jail. How much time did he get? A whopping 14 days and less than 1% of the maximum fine. The court gave him the light sentence because he had come forward and admitted to the killings. But he didn't do it out of the kindness of his heart. He came forward only to get back at his boss who he claims told him to kill the eagles in order to protect his flock of sheep. While officials brag that the government took this case seriously — pointing to the fact that this is the first time in Victoria history that someone has gone to jail for wildlife destruction — the severity of Silvester's case and the light sentence seems to suggest the opposite. This was an extremely egregious crime. One that involved the killing and torture of hundreds of animals. It is almost unthinkable that Silvester shouldn't be behind bars for years, but in Victoria, prosecuting crimes against wildlife is doesn't seem to be a priority. That needs to change. Cases like these must be taken seriously and punishment should reflect the damage abusers have inflicted on wildlife. In this case, the court's message is that no matter how many animals you kill, as long as you say "I'm sorry" you can get off with a slap on the wrist. If not, then there is no deterrent for others. Please sign the petition and demand that Victoria implement harsher minimum penalties for wildlife abusers. Without them, these kinds of stories will continue to the detriment of Australia's beautiful wildlife.